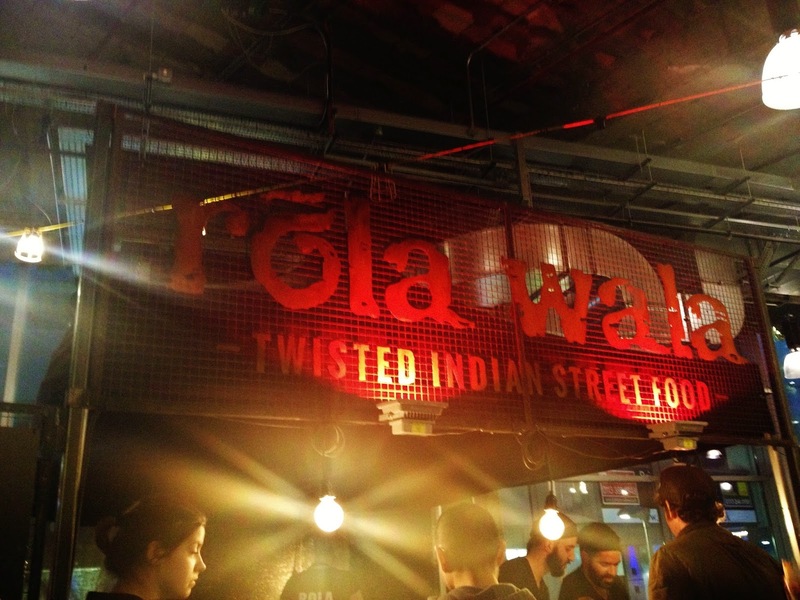 Rola Wala started out life as a street food vendor gracing the streets of London and then beyond. They came to Trinity Kitchen as a part of the ever rotating street food vendors, then they obviously fell in love with us (as we did them) as they decided to set up their first permanent residence here! 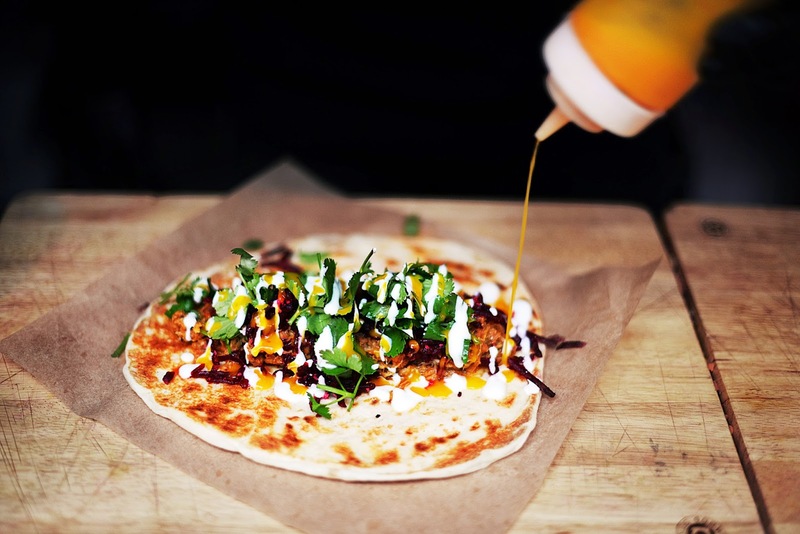 Since then Rola Wala has gone from strength to strength and is now set to open three more permanent sites in London. What's with the name? Rola Wala translates in Hindi to "the man that rolls". 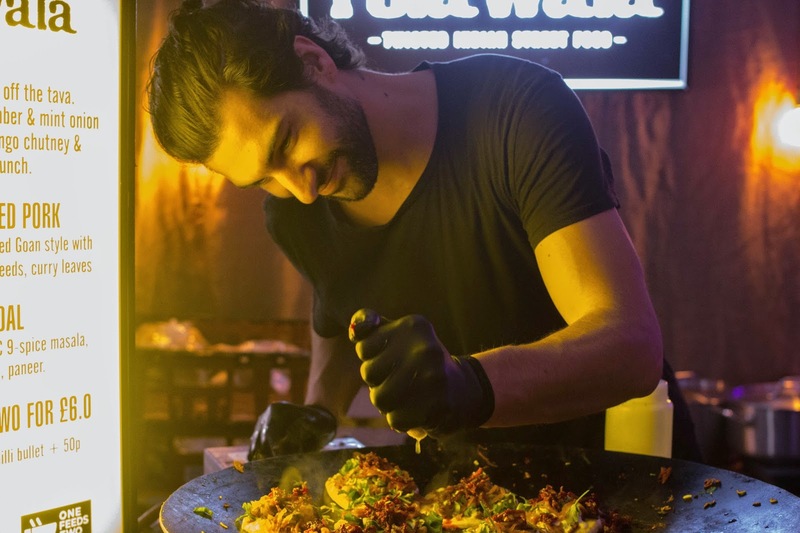 RW offer eastern flavours in a street food concept, the wraps are made from lightly toasted naans and contain Indian inspired filings. It's nothing I've ever had before, it's in a completely different world from the Indian wrap I tried in a pub once (see here). I met with Mark the owner, who is incredibly nice, cool and laid back guy, but also an incredibly busy and sort after person, and rightly so. The owners work with local and national suppliers and it was nice to get some background of what I was eating and drinking. They source their meat from Yorkshire suppliers the Yorkshire Dales Meat Company and are in partnership with Leeds brewery too. I hadn't realised before but just around the side from the main serving area is a bar, where you can purchase craft ale on tap or in a bottle. On this visit I opted for the Naan Roll, filled with Bengali Beef (slow cooked beef brisket with Bengali spices - also Halal), with fresh salad and a medium sauce. D went for the Goan Pulled Pork Naan Roll (slow roasted free range pork with Goan-spiced flavour injection), with fresh salad and a hot sauce. To accompany our rolls we had two ginger beers from Square Root London, which we were informed were made by a guy in London who makes them in his garage! They were pretty good and an absolute God send for my sore and prickly tonsils. The rolls went down very well, we ate them in no time. D's pork was a lot moister than my beef and it caused a bit of a puddle on the table but this wouldn't deter me from ordering this again. My beef was packed full of flavour, and the spice really helped my sinuses! Looking around the area of Trinity Kitchen that Rola Wala shares with Pizza Luxe it was clear to see who the domineering producer was. Almost everyone had Rola Wala. I only saw one person with pizza and I think she worked for them. The other options on the menu include Kashmiri chicken tikka, Keralan dal (veggie), roasted mumbai gobi (veggie), and you can upgrade your roll with paneer too for an extra 50p. If you don't fancy a roll the other option is a hot bowl, these are the fillings above served on a bed of wild rice, roasted Mumbai gobi, pickles, lemon and chutney. All this for the same price as the roll (£6.50). Next time I'll be sure to order one of these, they were certainly popular looking around. I wish Rola Wala well in their future ventures and I hope they stick around in Leeds for the considerable future. They also have a kids menu too. We went here in early December and I was really impressed - tasty and very good value! I need to go back and try some other Trinity Kitchen venues but I suspect if I do I'll find it tough to resist those amazing wraps.